Even as countries around the world such as Thailand, Vietnam, Nigeria, and Hong Kong (China) are getting slammed with massive e-waste shipments posing as benign recyclables or repairables, the Basel Convention Parties are poised to adopt at COP14, what will be a massive loophole, exempting what could be a majority of the world's e-waste. The loophole is found in Paragraph 31(b) of the Guidelines. If adopted with this paragraph, the Guideline will allow unscrupulous traders to export all manner of hazardous broken or untested consumer electronics outside of the control procedures of the Basel Convention simply by making a claim of " export for repair". Yet, all electronic equipment can be called "repairable" and almost all actual exports for repair involve exports of non-functional parts which are waste upon arrival. The PACE and the MPPI Guidelines never allowed non-functional equipment to be declared as non-waste. It was universally agreed that doing so would be a very bad idea. Sadly, the overreaching reversal of Basel norms which erase Basel Convention controls is the recent achievement of the electronics manufacturers (Digital Europe and ITI). However, this corrupt notion would never have had a chance were it not for the sudden reversal and unyielding press put on by Germany, Belgium, and the European Commission on behalf of the entire European Union, who seem bent on doing the bidding of a myopic electronics industry even as this new guidance runs contrary to EU law (WEEE directive). This loophole makes the Guideline contradictory to the Convention simply because electronic products at end-of-life are in scientific fact -- hazardous waste. But, rather than putting their effort in making their products non-toxic and thus legitimately fall outside of the scope of the Basel Convention, the manufacturers have instead spent their profits from consumers on subverting the an international treaty and its scientific definitions by removing toxic wastes from its scope. Ironically, this move subverts all efforts to convince the world to move more aggressively to a circular economy -- the stated aim of the EU and the electronics industry. The architects of the circular economy concept, warn against allowing externalities which can subvert the perceived circle. If the 31(b) "Repairables Loophole" is sanctioned by Basel guidance and exploited by traders, the "circular economy" will be identified as yet another corrupt "buzzword" to institutionalize gross externalities and global irresponsibility -- providing benefits for developed countries at the expense of the global south. 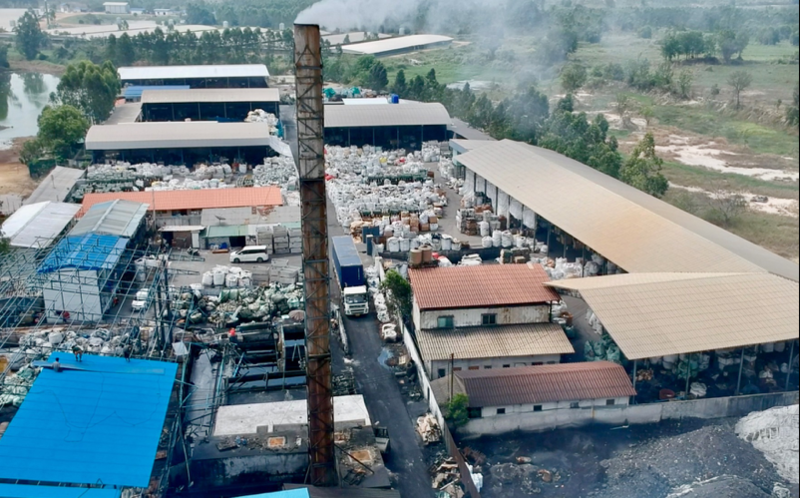 Two months ago, Thailand was forced, on an emergency basis, to raid and shut down scores of e-waste import factories that have sprung up across the Thai rural landscape -- all claiming to provide recycling and re-use for discarded electronics. The factories, several of which were discovered by BAN's GPS trackers, are veritable dioxin factories, crudely breaking down and then smelting circuit boards while spewing dioxins, furans, heavy metals, and PAHs across the landscape. Primitive, highly polluting, circuit board smelter spewing dioxins and heavy metals out over dairy cattle in fields below. This site, discovered by BAN in Thailand in February was reported to the Thai government and is now closed following raids on scores of such factories conducted in the Spring of this year. Thailand subsequently imposed an emergency national prohibition against importing any e-waste. Such e-wastes had been imported under the pretense of recycling and repair. The current Guideline on e-waste would make such exports legal and easy. Copyright BAN, 2018. Sadly, the last meeting of the Guideline Expert Working Group, held between the 17 and 19th of April this year, failed utterly to improve things. Worse, trickery was employed in the last hours to pretend to address the issues of concern posed by delegates. These concerns included limiting the 31(b) loophole to exclude equipment with little remaining residual life, to exclude obsolete equipment such as cathode-ray-tubes, or equipment with banned or extremely hazardous substances, such as LCD displays containing mercury. The deception was accomplished by Germany's insisting that virtually every issue raised could be addressed by putting language into Paragraph 30 and this was done. However, when BAN pointed out that Paragraph 30 states in its chapeau that everything in it is " without prejudice to paragraph 31" and thus would have no effect on the massive gaping loophole that is 31(b), the EU chair ignored this obvious contradiction and refused to address the fact that all of these changes therefore had no meaning with respect to the waste definition exemption. In a final insult to developing countries and the "raison d'etre" of the Basel Convention, all efforts to conform to the Ban Amendment, even in spirit, by managing the imported toxic residual parts and materials from repair operations in Annex VII countries was ignored. It is clear that with the EU, having a stranglehold on this document going forward, that there will be little chance of reforming this guidance document even while it flies in the face of the principles if not the legal letter of the Basel Convention, including the principles of national self-sufficiency in waste management, and the principle of minimizing transboundary movement, the principle of prior informed consent, etc. BAN therefore, at this juncture calls on all Parties to speak out in the plenary and in regional grouping statements at the upcoming meeting, against the adoption and use of the Guideline. Further, all Parties should refuse to use it as written. Far better, is to adopt the original fundamental principle embraced by PACE and MPPI, that is, -- if a device is not tested and demonstrated to be fully functional, then it is to be considered waste and subject to the control procedures of the Convention when it contains hazardous materials. To do anything less, as this document most blatantly does, is to undermine the Convention itself.